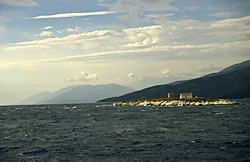 In the Strait between Ithaka and Cephalonia lies a low rocky islet, Daskalio, the probable place where the suitors lay in ambush for Telemachus. Homer tells that Telemachus, Odysseus' son, succeeded in escaping from the suitors and embarking in the Harbour of the City to search for information on his father's fate from Nestor at Pylos and from Menelaus in Sparta (Peloponnese). A few days later the suitors hear of it and decide to intercept the young man on his return. To this end they send a ship in the strait separating the island from its neighbour, Cephalonia, and take up position on an islet, Asteris (Od., IV, 660-672) "above which lies a double harbour". Nautical charts indicate indeed an islet in the middle of the strait between Ithaka and Cephalonia, Daskalio. The modern Greek name derives from the Italian scoglio. "Would not that islet be the Daskalio of the nautical charts, the Asteris of the homeric poem ? Asteris, the star in Greek, which stands out against the dark blue sky like the bright shining islet stands out in the sun against the wine-red sea ?" Everything suggests it. Everything, if… a passage of the text did not sow doubts since antiquity in geographs' minds : since no portolano, no nautical instructions mention amphidumoi harbours, "double" or "twin harbours" or "double-entry harbour" on this flat rock two hundreds meters long and only a few tens wide. We must go there and see. We get nearer to the islet as slowly as we can owing to the wind force. The sea breaks against the emerging rocks protecting it to the north. Here, there is no "harbour where to anchor", however small it could be. No cove, no shelter in sight where to land, even with a catamaran. The southern end of the islet presents indeed a small narrow and short rocky inlet, but without shore to land. On the west coast facing Cephalonia a narrow strip of sand extends to the sea where in calm weather one must be able to haul up a small boat and disembark furtively a few men before setting off again. With that force 5-6 north-west wind blowing on these low rocks which do not offer the slightest shelter I cannot expect to disembark men and equipment in the dinghy." In fact, the twin harbours are not on the islet but two miles farther north-west at Fiskardo (Cephalonia), "above" for anyone coming from Ithaka.